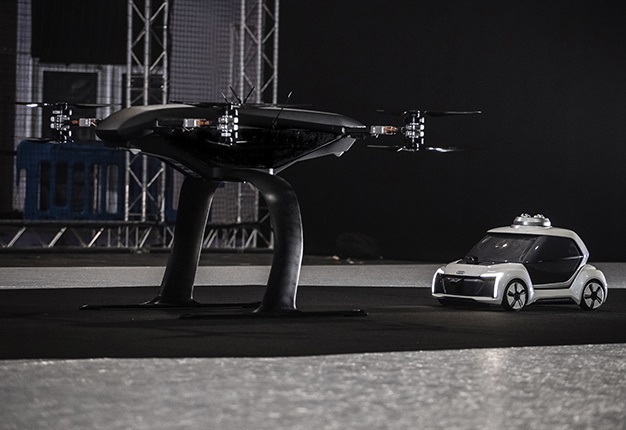 Audi, Airbus and Italdesign are testing a flying drone-car mashup which could provide a preview of future air taxis. The 'Pop.Up Next' prototype was driven and hovered across an Amsterdam exhibition hall during Amsterdam Drone Week. 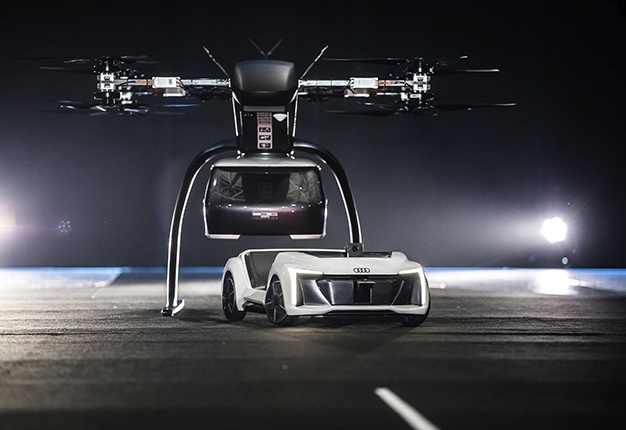 The revolutionary design is made up of three separate modules - a chassis with wheels, a two-seat capsule for passengers and a four-rotor drone. Don't plan on hailing such an airborne ride any time soon; Airbus executive Jean Brice Demont estimates it will take more than a decade for a large-scale rollout of such a service. 'There are several steps to be taken before the Pop.Up Next, or a future iteration of the drone, is ready for commercial use. "For this, we need to tick a list of boxes - the vehicle is one, safety is the overarching one, infrastructure is one, acceptability is another one," said Airbus executive Jean Brice Dumont. "I think it will take more than a decade until a real significant, massive deployment of an air taxi system' is ready." Audi also revealed that it is conducting tests in Latin America where customers can book helicopter flights in combination with Audi transport services on the ground. Dr Bernd Martens, president Italdesign, said: "Flying taxis are on the way. We at Audi are convinced of that. "More and more people are moving to cities. And more and more people will be mobile thanks to automation. In future senior citizens, children, and people without a driver's license will want to use convenient robot taxis. If we succeed in making a smart allocation of traffic between roads and airspace, people and cities can benefit in equal measure."